The Prime Minister’s Withdrawal Agreement failed again, by 58 votes. An amendment put forward by Sir Oliver Letwin passed in the Commons on Monday, giving MPs control of the House Brexit business on Wednesday. Parliament took control of the Brexit process through indicative votes on Wednesday, although none of the eight options suggested gained a majority. Parliament voted at 2.30pm this afternoon on the Withdrawal Agreement but, unlike previous votes, the Political Declaration was not included. If the Withdrawal Agreement passed, the UK will be granted the extension until the 22nd May so that the Government “can consider the issues (political declaration) further.” It was considered to be the last chance the Government had to avoid a longer extension and involvement in the EU Parliamentary elections. Despite the fact that there was new support for the Agreement from Eurosceptic MPs, the vote was unable to pass through Parliament, losing by 58 votes. There is a feeling amongst some members that this defeat was a much smaller margin than previous votes, and there may be an option to bring the agreement back to the floor next week for another vote. However, the EU has been extremely clear that 11pm tonight is the deadline for an extension until 22nd May. The Prime Minister stated that this result would have “grave” implication and it now falls to the EU Summit on 10th April to decide on either a no-deal or a longer extension, involving the UK’s participation in the EU elections. Theresa May suffered a defeat in the Commons on Monday as MPs voted 329 to 302 in favour of an Amendment by Sir Oliver Letwin which meant MPs took control of the House business on Wednesday to hold a series of ‘indicative votes on Brexit’. Indicative votes allow MPs to decide on a series of options designed to see what can command a majority in Parliament. This meant that that MPs, rather than the Government, decided Wednesday’s business motions relating to Brexit which allowed MPs to vote on a range of different Brexit scenarios with the aim of securing a majority for the way ahead. Government has been clear that they are not bound to deliver the options decided on, with Andrea Leadsom on the Today Programme stating that none of the initial 16 options tabled were realistically deliverable. However, there is a legal and constitutional argument that implies that it would be “prudent” for Government to take note of the votes if they show a clear path forward. NO, NO, NO, NO, NO, NO, NO, NO. Oh Mama Mia Mama Mia! On Wednesday night, the Speaker selected eight options for Parliament to vote on. No option won a majority of support in the Commons. Parliament is now deadlocked on a way forward to resolve the Brexit crisis after these votes showed that there was no option commanding majority support. Surprisingly, there were closer-than-expected results for a Common Market 2.0. This would provide harmony between the SNP and DUP, as it would preserve freedom of movement and frictionless trade which would preserve the integrity of the union, which has been the DUP’s red line. However, many believe that this would require changes to the Withdrawal Agreement and therefore continue to vote against it to allow for further negotiation. In reality, only the Political Declaration would need to be amended to allow for a Common Market 2.0. Something that now will most likely only be possible through a longer extension. More indicative votes will be held on Monday 1 April. Many believe that there will be more incentive to build a Parliamentary majority with a further defeat to May’s Withdrawal Agreement, considering how the extended Brexit date is only fourteen days away. It is uncertain how the Prime Minister would break the deadlock if the Indicative Votes fail to show a clear path forward on Monday. Theresa May offered to resign as Prime Minister in a last-ditch effort to get her deal over the line. Speaking to Conservative MPs at a 1922 Committee meeting on Wednesday evening, the PM pledged that if her deal passed through the Commons with their support, she would stand down to allow a future leader to take over for the second round of negotiations. Although she did not name a departure date, Number 10 clarified that she would call a leadership contest within weeks of the withdrawal agreement’s ratification. The PM had already pledged to stand down before the 2022 General Election, so the end of her Premiership was always a matter of when, not if. But this offer has been perceived as a selfless move to end the uncertainty and to ensure that she delivers Brexit. Within hours of this announcement, over 20 Conservative MPs announced that they would now support the PM’s deal, including Boris Johnson. The PM led a charm offensive at Chequers over the weekend to gain the support of senior Brexiteers from the ERG. Jacob Rees Mogg, Iain Duncan Smith, Dominic Raab, David Davis, Steve Baker and Boris Johnson were all in attendance, as well as Cabinet Brexiteers such as Michael Gove and Steve Barclay. The focus of the talks was to convince these MPs to rally around May’s deal, in order to prevent Brexit being delayed or halted altogether. In a stunning turn of events, these talks appeared to be successful. On Monday morning, Jacob Rees Mogg indicated that he would support her deal if the DUP voted for it. Boris Johnson completely changed his position from calling May a ‘chicken’ and urging her to drop her deal in his Daily Telegraph column to falling in behind the PM’s deal. This sudden pivot in support angered a lot of Brexit voters, who have fully bought into the ERG’s rhetoric that no-deal is the ideal outcome, but it appears that many of these MPs are confident that if they do not support the PM’s deal, then Brexit will either be softened or stopped. It is almost certain that their support was also conditional on May resigning and allowing a future PM to lead the second stage of negotiations. Reports suggest that the EU has planned for April Fools’ Day 2020 as the next Brexit date should a longer extension be requested on 12th April. It is rumoured that this date was internally decided amongst the EU before Theresa May requested a short extension and remains an option if she returns to Brussels having failed to ratify a deal. The reason for this date is that it would ensure the British Government would not have any opportunity to interfere in the EU’s long-term plans, including its budget. An official has stated that the 1st April 2020 “would safeguard [the EU’s] work during this year and basically allow [the EU] to turn to it again early next year…giving more than that time runs the risk of mischief by the UK”. However, it is important to note that no official request has been made by the UK for a longer extension. As the deal was not agreed upon today, following the legal terms from the European Council last week, then the option of leaving on 22nd May is removed, leaving 12th April as the only option. There is now an expectation that a special Brexit summit on 10th April will result in EU leaders deciding between a no-deal Brexit or a long extension. Tusk’s comments this week suggest that the EU would be willing to offer a year long extension to the UK, however this does depend on whether there is a clear direction from the UK Parliament over Brexit negotiations. EU Commission President Jean Claude Juncker made a speech in the European Parliament on Wednesday, in which he criticised the UK’s approach to Brexit. In his speech, which was made hours before MPs in the UK Parliament would begin voting on a series of indicative Brexit options, he said that a sphinx would be an open book in comparison to the UK. Essentially, he is saying that the UK position is an impossibly complex riddle. EU Council President Donald Tusk also spoke in the EU Parliament that day, yet he was far blunter in his comments. Tusk stressed that “you cannot betray the 6 million people who signed the petition to revoke Article 50” and highlighted that there was an increasing majority of people in the UK who want to remain in the EU. Considering the UK Government had recently replied to everyone who had signed the petition maintaining that the UK would not revoke Article 50 because it would cause “irreparable damage to public trust”, his comments can be seen as a direct challenge to the Government’s position. As Europe becomes more sceptical about the progress of the Brexit negotiations within the UK Parliament, no-deal preparations are being stepped up. This has caused some tension between the EU and Northern Ireland. The EU stated this week that there had to be checks on cross-border trade in the event of a no deal, which could now occur on April 12. However, the Irish Prime Minister wishes to adhere to the Good Friday Agreement which calls for open borders. Additionally, Leo Varadkar argued that it is too early in the negotiation process to be having these conversations, clearly remaining optimistic that Theresa May will pull a rabbit out of her hat to avoid a no deal on April 12. The large difference in the approach to preparations is causing a strain in the conversations between the EU and Dublin, with expectations being that there will be severe disruption to trade if Northern Ireland is not prepared for border checks in the event of a no deal. 12th April: Cut off point for longer extension/UK leaves without a deal. 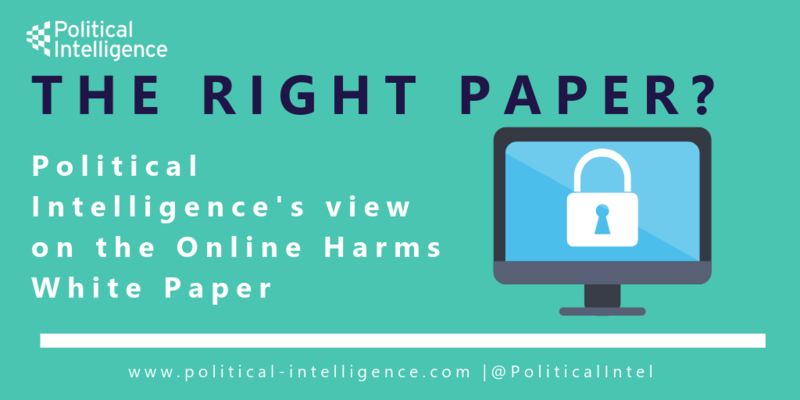 Online Harms: The Right Paper?